Harvest the Internet of Things. Control your energy. Wireless, battery-less sensors combined with enhanced RF technology gives you point of use control of lights, thermostats, and plug outlets – saving 20 – 50% of your associated utility costs. “Energy Harvesting” wireless devices and sensors mean installation costs are drastically reduced. It also means great efficiency for transmission. This of course translates into a better energy investment for you. Paybacks are often in the 2 to 5 year range. The above motion / light sensor is a wireless, battery-less, self powered, passive infrared sensor that ensures reliable detection of occupancy and daylight. 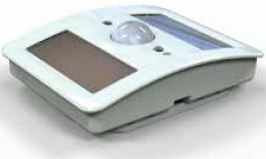 WEM systems can also provide real time energy measurement - to help maintain and document your savings.